A splendid new book from Monacelli Press marks the coming of age of urban agriculture — at least for the design world. Carrot City: Creating Places for Urban Agriculture is a timely reflection on design and urban food systems, and on the ways that agricultural issues are once again shaping urban spaces and buildings. At the heart of the book are over forty project case studies. These range from ambitious urban plans for the reintroduction of urban agriculture to our cities, to simple measures for growing food at home. (It's a special pleasure that the Urban Farming project in Middlesbrough UK, with which this writer was involved, is the first of the case studies in the book). An idea whose time has come…back? This is not the first time urban agriculture has been discovered by design. The economic and agricultural logic for locating fruits and vegetables close to a city's centre was artiucluated as a planning tool by the economist Johann Heinrich von Thünen as long ago as 1826. And although it seems hard to believe now, food production was integral to early modernist concepts of the city. In Garden Cities of Tomorrow (1902) Ebenezer Howard proposed that five-sixths of the land be dedicated to food production. Le Corbusier, in his 1922 Contemporary City proposal, included three types of food producing areas. And Frank Lloyd Wright's Broadacre City, in the 1930s, proposed that agriculture be integrated into dispersed low-density living. What actually happened, after von Thünen's early proposal, was a 200 year diversion fuelled largely by cheap energy. During World War II, it's true, spaces in many countries were transformed into remarkably productive areas; but food production as integral to cities disappeared after the war after with the growth of globalized industrial food systems. The difference today is that urban agriculture is emerging from necessity, not from the studios of cerebral architects. A powerful grassroots movement in recent years has given us the revival of farmers markets, community-supported agriculture and box-schemes, the 100-mile diet, and Slow Food. The physical and cultural connection of food and cities has been a largely bottom-up process to which the design world is now responding. The challenge for designers, say the authors of Carrot City, is to develop “exciting and innovative proposals for a future Productive City that will capture the imaginations of the public”. For urban agriculture to gain wide acceptance, they argue, the design of buildings and garden spaces around need to incorporate edible landscaping, and space for small livestock — and these must be aesthetically pleasing. This cultural challenge has been taken up with particular gusto in France. An enormous exhibition in Paris earlier this year, The Fertile City: Towards An Urban Nature explored nature in the city from multiple perspectives: historical, social, cultural, botanical, ecological. The Fertile City followed a competition among 12 famous architects to make Paris “the world's most sustainable post-Kyoto metropolis”. Out of this emerged the memorable metaphor of “Paris as a sponge”. The grand projects in Paris demonstrated once again that architects are adept when it comes to the visualization of enticing futures. The trouble is that their interest and capabilities do not extend to implementation. For our cities to become 'fertile sponges' in real life, someone has to to get their their hands dirty, and feet wet, in the context where such dreams would be built. Among the prosaic but life-critical barriers to food-growing in cities are food safety regulations. Food production can of course be environmentally degrading, and unhygienic, if poorly practiced; but legislative constraints are a terrible burden on the farmers and small-scale processors upon which re-localized food systems depend. (This regulatory straightjacket is a global challenge: An obscure (to this writer) organization called Codex Alimentarius Commission, for example, sets global food standards — but It is not subject to any visible form of democratic control). Evocative design visions will not be realized until this kind of policy barrier is included as part of the urban transformation process. In parallel with the grand architectural visions, new technical-ecological concepts of productive infrastructure are also emerging. Among those included in Carrot City are Greenhouse Villages being developed by the Dutch innovation Network. These design-led proposals aim to optimise urban food production by combining elements of permaculture, technology, and a whole-systems approach. A recent iteration of this genre, Polydome, aspires to achieve high yields by interweaving crops and livestock among highly diverse outputs — over 50 crops, two mushroom varieties, chickens, eggs, fish, and honey. Polydome envisions a fusion of urban form and industrial ecology — the purposive connecting together of productive gardens and resource flows such as waste heat, water, and nutrients available in waste. Andre Viljoen and Katrin Bohn, whose concept of Contuous Productive Urban Landscapes informed our project in Middlesbrough, suggest in their introduction that Carrot City be used as a toolbox and component store more than a blueprint for tomorrow's sustainable cities. This is wise advice: growing things, and standardization, do not make good bedfellows. But how to put all these components together? We can learn a huge amount here from experiences in the urbanizing global South. From Lima in peru, to Kinshasha in Zaire, and Rosario in Argentina, expertise has been accumulating on how to grapple with complex social-ecological networks of urban agriculture. As described by Mark Redmond and colleagues in his essential book Agriculture in Urban Planning, practical problems (the impact of pesticides, micro-biological risks, pollution and water contamination) are solvable. The real challenge is governance: How does one get the diverse groups of stakeholders involved in urban farming to work together? Among answers to the latter question is a technique called Multi-Actor Ecosystem Participation [MEPA]. This sounds like [and is] policy-speak, but the words mark a shift in the scale of design thinking — from the city to the bioregion. (Redmond's book marked the launch of a programme called Ecopolis which explores this shift further). Another lesson from the South is that necessity, more than aesthetic reverie, is the mother of urban transformation, and what drives that transformation is social energy more than the fossil-fuel kind. This is not to say that design has no contribution to make. On the contrary, Carrot City makes it easier than before to determine where design can make a real difference — and where it should leave well alone. The conclusion I draw is that the design focus right now should be less on production (lots of people know far more about that than we do) and less on awareness raising (we are aware) — and more on the design of alternative trade networks and new distribution platforms. I'll be returning to those topic in the near future. Carrot City: Creating Places for Urban Agriculture is written by Mark Gorgolewski, June Komisar and Joe Nasr. There's a talk and signing on 5 October in New York with June Komisar and Joe Nasr 12:30pm at the Van Alen Institute. As much as this article has legit information and synthesizes some really great ideas, I must say, I was quite put off by the author's referring to the Democratic Republic of Congo as Zaire. This country hasn't been "Zaire" since 1997, and it can be taken as quite offensive (harking back to the dictatorial period under Mobutu and the horrors that took place under his thumb). I don't mean to come off as pedantic, but the author should do his research before talking about countries he's not completely familiar with. 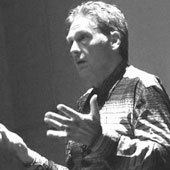 John Thackara is a writer, speaker and design producer, and director of Doors of Perception. In addition to this blog, he is the author of twelve books including In The Bubble: Designing In A Complex World and Wouldn’t It Be Great If…. I spent the last two weeks in-and-around a care home in England that looks after people with dementia and terminal illness, and their families – including, this time, mine. A two-year project in Belgium proposes new relationships between people, goods, energy, equipment, spaces, and value. Its design objective: a networked mobility ecosystem.